It was morning in late July and we had 5 days left of support raising before we left Fishers for good. A few weeks before, we had moved all of our belongings into our new Orlando home and after a week of moving in, we returned to Fishers to attempt to complete our financial support. I was sitting at our friend’s dining room table reading my email when I saw it. One of our friends was joining our support team at $1000 a year. 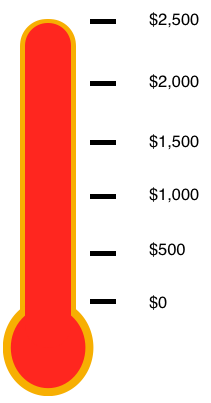 That pledge put us over the top of our goal of $2,500 a month of new support that we needed before we moved to Orlando. I stared at the screen with mixed emotions. I remember starting this process just a few months earlier overwhelmed by that huge number that we needed to raise. It seemed like such a mountain to climb in such a short time. How could we ever raise it? I was already exhausted by a full year of ministry and all the moving transition stuff – do I have the energy to pursue this new support goal? And yet, just a few months later, there I was, looking at the long list of names of people who have lovingly and faithfully joined our team or increased their financial support to send us into this new mission field. We call that day “Pie Day”. I told the kids that when we reach our goal, they can all throw a pie in my face, and that is exactly what they did. We caught it on video and posted it above if you want to watch us celebrate. We have now been in Orlando for 2 weeks, we’re settling in and preparing for the start of the school year. Please pray for our kids as they start a new school, and for Dawn and I as we jump into our new roles. We are excited, overwhelmed, and trusting in our good God who provides all that we need. Awesome Bro! Love the idea of Pie Day. I think you love it more than the kids did – though I thought Jake was going to take your head off with that Pie dude. I’m so happy for you and grateful to God for allowing you to raise the necessary funds. We can’t wait to come to visit you in Orlando soon.